SunPine – a great employer in every way! Lindbäcks Group wins the SunPine Sustainability Award. They will receive the award for their holistic approach to sustainability and their focus on gender equality in a traditionally male industry. “Managing to go from 6 per cent to 20 per cent women is a giant stride,” declares jury chairman and SunPine CEO Magnus Edin. Lindbäcks Group has established a sustainable approach throughout its business operation. Lindbäcks uses wood for construction as it is the only renewable building material. Increasing the proportion of wood in construction makes the building industry more climate smart. Multifamily dwellings built from wood emit 50 per cent less carbon dioxide during their total life cycle than houses with concrete frames.And the rational, efficient construction process in factories also minimises spill, wasted materials and energy. What’s more, the new factory is self-sufficient in solar energy and district heating. So, when it was time to staff Lindbäcks’ new factory on Haraholmen, it was naturally also time to break with the industry’s predominantly male hierarchy and go for equal opportunity. This resulted in 20 per cent female staff compared to the 6 per cent at Lindbäcks’ first factory. Why did Lindbäcks Group win and not Lindbäcks Bygg? For Magnus Edin, the decision to present the Sustainability Award was an important one. 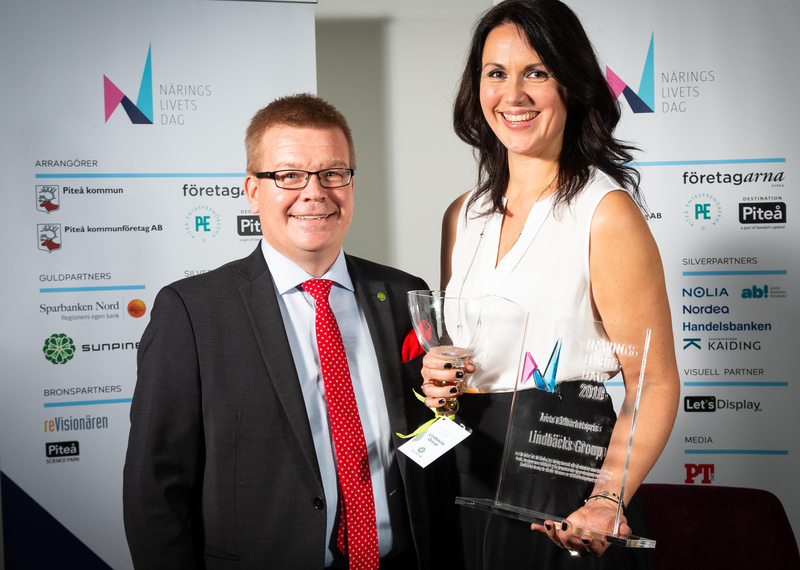 The Sustainability Award was presented for the first time on November 9 at the Piteå Business Day Gala at Pite Havsbad, where the happy winner received a specially designed glass bowl from Linda Isaksson, Heta Hyttan in Piteå. “She’s created an utterly unique glass bowl and she incorporates our tall diesel and rosin in the actual glass. Not only is it locally produced, it’s also unique,” says Edin. So, when it was time for the sawmill in Munksund to take on temporary summer staff, they decided to surpass SCA’s own 30 per cent target for female temps and go for 50 per cent. And they succeeded! Despite its technological and industrial focus, Biobase has unusually good gender balance. 39 per cent of the delegates were women, as were 39 per cent of the speakers. Piteå Science Park succeeded in something equally as difficult as it is self-evident by delivering quality and gender equality.